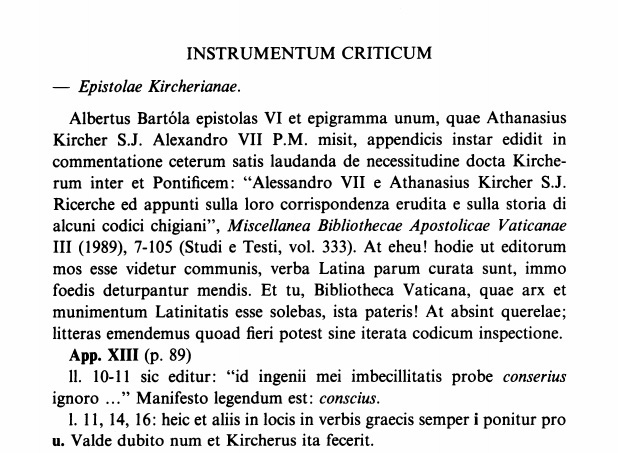 “Alessandro VII e Athanasius Kircher S. J. Richerche ed appunti sulla loro corrispondenza erudita e sulla storia di alcuni codici chigiani”, written by Albertus Bartóla (1989). 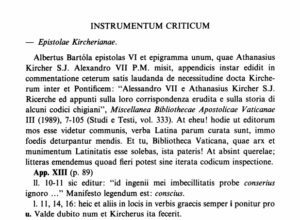 Seems the article was not edited with the desired rigor expected in a work of this kind, mainly when the contents self were the ‘erudite letters’ crossed between Kircher and Alessandro VII. The corrections made to these ‘appunti’, and only the registered in the Humanistica Lovaniensia article, surpass the 26 numbered. How can be possible, in such publication, find so high quantity of ‘lapsus calami’? This is the same thing that IJsewijn ask, in a bitter but at same time, ironic latin. ¡O magno trolleo classico, nunc ad nos ex praeterita retornas! Curiously, the article closes without any other kind of statement about the errata registered by Bartóla. “At absint querelae; litteras emendemus quoad fieri potest sine iterata codicum inspectione”, wrote IJsewijn in the beginning of the review, sure of his capabilities as editor, author, erudit reader… and too, as a ‘classical troll’ devoted to most serious affairs.